There are many different options in granite kitchen countertops today, which are created by numerous manufacturers located all over the country. The massive amount of options that are available can make choosing the right granite countertop for your home difficult, but if you are aware of what options are available, you will make the experience of shopping for a countertop much less complicated and time consuming. There are several different criteria that will need to be taken into consideration when trying to find the right granite countertop for your home. Granite countertops are available in many different colors and each color may have several different shades to choose from. Some of the most popular colors chosen by homeowners for their granite countertops include black, gray, brown, and tan, although more adventurous homeowners may want to consider pink, blue, red, or green shades as their countertop color. Each of these colors come in hues ranging from very dark to very light, so it is important to actually see the shade that will be installed in the home and compare it to the existing décor or the color scheme that you are thinking about implementing to make sure that the colors complement each other. There are two different types of granite countertop materials to choose from for the creation of the granite countertop for your home. The first material is a natural granite slab, which can come in different thicknesses and colors depending on where the granite was obtained from. The beauty of the natural granite slabs is breathtaking, but the color and pattern of the slab are often unique making it very difficult to add additional pieces or find replacement pieces later that match the stone of the countertop perfectly. 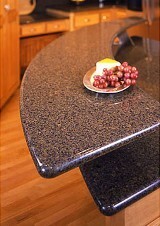 Another option for homeowners is a countertop that is made out of granite tiles. The granite tiles are glued to a countertop foundation using a high strength epoxy and then sealed with a thick layer of clear sealant that brings out the beauty of the stone used to create the tiles. Using granite tiles for the countertop gives the countertop all of the desirable properties of a granite slab countertop but costs a fraction of the price of a countertop made out of granite slabs. There are a number of different styles and edges that can be used to further customize a granite countertop for your home. The fanciful edging styles can be chosen to complement the home's décor or create a dramatic effect in a subtle way. The most common edging styles used for granite countertops include rounded edges, beveled edges, bullnose edges, and ogee edges. Many manufacturers of custom granite countertops will have a variety of different edging styles for the homeowner to choose from in order to create the right granite countertop style for their home.